Check out James Franco and Bryan Cranston in their laugh out loud Christmas comedy Why Him? before it hits theaters! Click here to download your complimentary pass to the special advance screening being held on Tuesday, December 20 at 7PM in SLC. Seats in the theater are first-come, first-serve and are not guaranteed. Please arrive extra early for ticket exchange! Good luck and we’ll see you there! 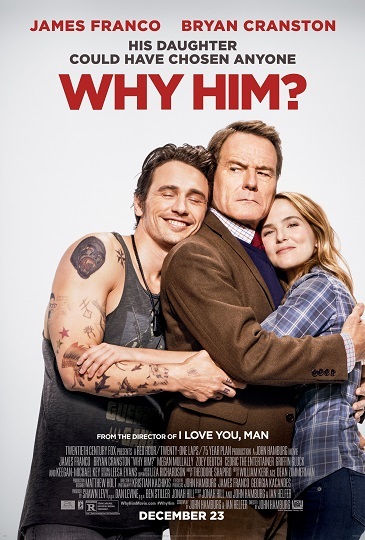 Synopsis: Over the holidays, Ned (Bryan Cranston), an overprotective but loving dad and his family visit his daughter at Stanford, where he meets his biggest nightmare: her well-meaning but socially awkward Silicon Valley billionaire boyfriend, Laird (James Franco). The straight-laced Ned thinks Laird, who has absolutely no filter, is a wildly inappropriate match for his daughter. The one-sided rivalry—and Ned’s panic level—escalate when he finds himself increasingly out of step in the glamorous high-tech hub, and learns that Laird is about to pop the question. Why Him? hits theaters everywhere December 23.